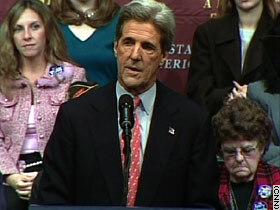 Presidential Hopeful Sen. John Kerry (D-Mass) has seen the latest polling figures and is clearly not feeling well. Says the unidentified woman seated directly behind Kerry at the podium, "Whew! I think he might have eaten Mexican for lunch!" This entry was posted on October 19, 2004 at 2:42 PM. You can skip to the end and leave a response.